Gift of Gab's voice is its own infectious instrument. But on Escape 2 Mars that alone can't shoulder the weight of dull hooks and trite, proselytizing lyrics. Gift of Gab is nothing if not infectious to listen to. His voice and his flow are really just extensions of the instrumentation behind him, a blistering lead to lay over the laid-back funk or spacey bleeps in the background. Whether on his own, or as part of Blackalicious, Gift of Gab offers something simultaneously exciting and comforting. You know his wordplay will be ridiculously fast -- as in, why bother trying to keep up with it in spots -- and, on his best stuff, that is enough to make the track work. And that happens a few times on Escape 2 Mars. "El Gifto Magnifico" thumps along on a clanging, Brazilian-influenced beat that sways enough to leave space for an energetic set of verses. Gift of Gab sounds here, as he always does when he's on his game, like the words are just falling out of his mouth, fully-formed into long, flowing phrases. He encourages us to "study his rap style" somewhere in that first verse, but it's best to sit back and let the words wash, or really rush over you until the great call-response chorus kicks in. Two tracks later, "Dreamin'" blows the rest of the record out of the water. It features Del tha Funky Homosapien and Brother Ali, and the two working with Gab prove a volatile trio. Each is at the top of his game, in particular Ali, who uses the verse to try to further extend his already well-varied style. He takes on Gift of Gab's phrase-spilling in his own way, resting the whole verse on the same assonance brilliantly without sounding monotone. And in playing with others, something he does rarely on Escape 2 Mars, Gift of Gab sounds totally riled up, trying to answer the call in front of two killer verses from Del and Ali. But "Dreamin'" ends up being a kind of Pyrrhic victory for Gab. As good as the song is, it also highlights what's missing from the rest of the record. 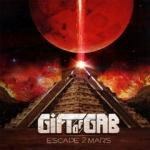 Aside from "Dreamin'" and "El Gifto Magnifico", little stands out on Escape 2 Mars, at least for any good reasons. And both Del and Ali manage to out-wordplay a guy who claims it as his bread and butter by mixing their quick flow with affecting storytelling, something Gab tends to avoid. And, considering Gift of Gab calls out rappers for underachieving on "Rhyme Travel", his inconsistency here becomes even more problematic. It's not all bad outside of those highlights. The title track and "Richman, Poorman" show Gab finding that quick-fire flow and settling in, and we settle in with him. But the former deals with apocalyptic paranoia as we slowly destroy the world with industry, and the latter is a pretty lame indictment of greed and capitalism. So while his rhymes remain tight and shifting throughout, the ideas and images he populates them with sound pretty unimaginative. And then there's stuff like "In Las Vegas", which is as cheesy and neon as the city it celebrates, or the trudging, rap-sung verses of the way-too-preachy "Electric Waterfalls". In these moments, Gift of Gab loses his way totally. He clings to the album's combination of sci-fi nerdiness and R&B jamming, which is a charming combination when done right, but leaves behind the pure sound of his flow that draws the listener in. And while there's a nice throwback to the soulfully sung hooks on songs like "Light Years", the hooks themselves are pretty tired throughout. That leaves the weight of each song purely on Gab's shoulders, and he responds early, but sounds fatigued as the record moves on, and laid-back groove falls into tired rut. It's too bad, really, that Escape 2 Mars doesn't quite work. Because "El Gifto Magnifico" and "Dreamin'" almost make this album worth the price of admission. Almost. But in the same way Gab's voice can't shoulder the weight of dull hooks and trite, proselytizing lyrics, those two songs -- as strong as they are -- can't hold up the whole record.